Fethard (Fiodh Ard) (pop.1400), located south of the Slieveardagh Hills and northwest of Slievenamon, on the River Clashawley (not to be confused with Fethard-on-Sea in Co. Wexford) was once an important market town. Nowadays it is a friendly place with several good pubs and eateries. Founded as a chartered borough by William de Braose in 1201, and initially populated by tenants from his estates in Wales, Fethard was laid out systematically, with a regular pattern of streets. a clearly demarcated market area, and a conveniently located church and graveyard. The Everard family were prominent in the town from the early C15th to the C17th. Sir John Everard served the Earl of Ormond as the Butler family lawyer. Queen Elizabeth I rewarded his performance as a justice in the Earl’s Liberty of Tipperary with an appointment to the Queen’s Bench in Ireland in 1602. Although the Everards were Roman Catholics, Sir John pledged allegiance and surrendered all his property to the Crown in 1607, to have it immediately granted back to him. In 1612 King James I sanctioned the building by Sir John’s grandson, another Sir John, of two almshouses. During the mid-C17th Wars of the Three Kingdoms Fethard sensibly surrendered to the Earl of Inchiquin‘s Parliamentarian army in 1647 and in 1650 to Oliver Cromwell himself; he described the town in a letter as “having a very good wall with round and square bulwarks, after the old manner of fortification“. The Everards had to flee abroad; some returned after the Restoration, and another Sir John was killed fighting por the Jacobites at the Battle of Aughrim in 1690. In 1752 Sir Redmond Everard, who lived in France, sold the last of the family properties in Fethard to Thomas Barton, a wine merchant from Bordeaux. He replaced the Everard Mansion House with a new residence of the same name, which was converted into a military barracks early in the early C19th, evacuated by the British Army in 1921, seized by Republican Irregulars during the Civil War and burned down in 1922 to prevent its use by Free State troops. Substantial sections remain of the medieval town wall, first erected in 1292, together with the C15th North Gate and Mural Towers. Several medieval buildings can still be seen in the town, usually at least partly incorporated into later structures and difficult to access. Holy Trinity church (CoI), founded in the C13th, is widely regarded as one of the finest medieval parish churches in Ireland, although much of it was altered or rebuilt over the centuries. The original chancel is now in ruins; the oldest parts of the edifice still in use are the nave, part of a transept and the landmark belltower (c.1480, restored c.1775). There are interesting tombs and monuments both inside the building and in the atmospheric churchyard, partially enclosed by the old town wall. Fethard Abbey, a C14th Augustinian friary, was the “old abbey in the suburbs” where Oliver Cromwell quartered his troops in 1650. Partially restored in 1820 and still in use as a church (RC), it has some fine medieval stained glass windows and a striking sheela-na-gig, one of four in the vicinity (another is on the old bridge crossing the River Clashawley). The Abymill Theatre next to the Abbey has hosted drama productions, musicals, ballets, classical musical ensembles, school plays and variety shows, a film club, a folk club, large meetings and lectures since 1988, when the old Coffey’s Mill, built in 1791 and closed in 1936, was restored. The church of the Most Holy Trinity (RC) is a fine Georgian edifice, built in 1819 on land gifted by William Barton of Grove House, father of General Sir Robert Barton (1770 – 1853). Fethard Folk and Transport Museum, housed in the former railway station, makes for an interesting hour or two, and hosts weekly Car Boot Sales and regular Collectors’ Markets throughout the year. The Tipperariana Book Fair, one of the largest in Ireland, has been hosted annually by the Fethard Historical Society on the second Sunday in February each year since 1996. The Tirry Centre, providing tourist and civic information, is named for Fr William Tirry, a Fethard native of Old English stock, who was active as an Augustinian priest in the region during the Cromwellian regime, for which he was hanged in Clonmel in 1654. The Killusty Horse Show is a major equestrian and social event, held for more than 40 years in the first week of July. Beechmount Farm is where Jane & Louis Grubb have produced their suberb Cashel Blue Farmhouse Cheese since 1984. Coolmore Stud claims to be the largest thoroughbred horse breeding operation in the world. Kiltinan / Kiltinane Castle is an imposing rock fortress located three miles south east of Fethard, overlooking the River Glashauney, with fine views of the River Suir Valley. The towers have walls of great thickness, and vaulted stone ceilings. The castle well has a passage leading to it down 87 steps. The site includes the ruins of a medieval church and settlement. 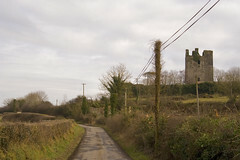 Kiltinan was one of six castles founded by Phillip de Worcester, who came to Ireland as King Henry II‘s Representative in 1184, and was granted all of South Tipperary by Prince John in 1185. Records show that by 1353 the lord of Kiltinan was John de Bermingham, whose daughter married Peter Butler, 2nd Baron Dunboyne. In 1402. Lord Bermingham passed the property on to his cousin, who in turn granted Kiltinan in 1410 to Sir Thomas Butler. Edmund Butler, 5th Baron Dunboyne, felt that he had a right to the property, contending that he had inherited it through his grandmother, but another Edmund Butler from Kilmainham also laid claim to Kiltinan. The head of the family, John Butler, 6th Earl of Ormond, decided that the contestants should settle the dispute with broadswords on the green before the castle. The fight between the two Edmund Butlers took place on a spring day in 1420. Both sides were seemingly well matched until hours into the match, when Dunboyne was suddenly slain, leaving the Kilmainham Butlers in possession. After some thirty years of legal wrangling and much money had changed hands, Kiltinan was handed over to the Dunboyne family, who became Seneschals of the Palatanate of Tipperary for many years and occupied the castle until its capture by Cromwellian troops in 1649. Later it became the property of Richard Staper, who in 1669 sold it to Peter Cooke, whose descendants remained in residence until it was bought and tastefully restored by its present owner, the popular musical composer Sir Andrew Lloyd Webber, Baron of Sydmonton. Knockelly Castle was built c.1465 by Edmund FitzJames Butler, 8th Baron Dunboyne, for his second son Piers, who was slain by James Tobin of Killaghy in 1502. The Knockelly Butlers rose against the Crown during the Desmond Rebellions, for which their lands were confiscated in 1592. The castle subsequently passed through various hands into the possession of the Everard family. During the Cromwellian Protectorate it was occupied by Colonel Matthew Jacob, who abandoned it for more congenial accommodation at Mobernan. A romantic tale associated with Knockelly involves a poor orphan, Ellen / Eleanor Meagher, who fell in love with an English soldier called Robert Jolly, garrisoned in Fethard c.1680. He was soon ordered abroad on active service with his regiment. She was the ward and serving maid of a certain Mrs. St. John, who in due course took her to London, where she met a wealthy man (a Jew, according to the story), who was so captivated by her beauty that he married her and left her all his possessions in his will. Not long after his death the young widow saw her former beau on sentry duty outside a Metropolitan cavalry barracks. Reunited, they returned to Fethard and lived happily ever after in Knockelly Castle. Both are buried in the old town churchyard. The castle was acquired by the Barton family and leased to James Kickham , a cousin of John, father of Charles, the famous Fenian writer of Mullinahone. His youngest daughter Catherine (b.1808) married Patrick Heffernan of Derrygrath, who bought the castle, which remains in the same family. The ruin visible today comprises an early C17th Tower House (used as a cow byre) surrounded by a large well-preserved bawn with massive corner towers. Mobarnane House is a large, elegant C18th family house with late Georgian additions, set in 60 acres of agricultural parkland, undeveloped woodlands and landscaped gardens with a 3-acre lake. Recently restored, it is now run as a friendly Guesthouse by a terrific chef, Richard Craik-White, and his wife Sandra. Dinner is a convivial affair, served at a communal table. Fethard is linked by the R689 to Killenaule on ByRoute 5. Barrettstown Castle, a late medieval Tower House that was owned by the Barrett family from whom the former tiny parish of Barrettsgrange derives its name – Gráinsech a’ Bhairéideach, an Irish spelling used by the Barretts of Tirawley in County Mayo, as opposed to the Bairóideach spelling of the Munster Barretts. Barrettstown Castle is not far from Cashel on ByRoute 5.